Remember the good old days of advertising when all you had to do was go to your local newspaper and pay a couple bucks for a spot in the advert section? Me either, but like prohibition and John Travolta being attractive, they tell me that yes, this was once the case. Now customers have short attention spans and a keen sense for sniffing out BS in marketing campaigns. So what’s a business owner to do to get the word out that their company has an awesome product or service? 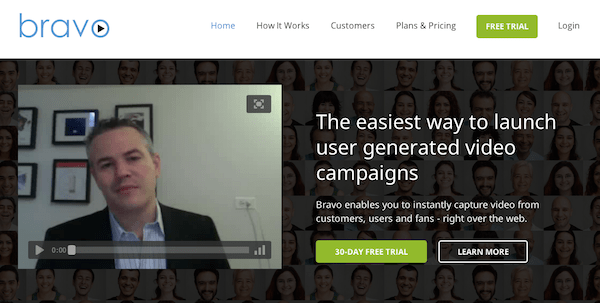 Bravo is a web app that lets businesses and organizations capture video from their clients, users, and fans. Those videos can then be used for a video campaign that people can actually get into. Bravo says they are the one-stop-shop if you are looking to include video testimonials or video contests (which apparently are all the rage this season) in your website or marketing strategy. Video testimonials and contests aren’t just a way of engaging with the public, this kind of outreach is also incredibly effective in generating a sense of trust and familiarity with a company or product. To put it simply, there are just some things that images and even the wittiest of text can’t do. On top of making it easier than ever to capture user generated videos, Bravo also has an analytics feature to help users measure the performance of each video campaign. Capture video (on Bravo’s site or your own). 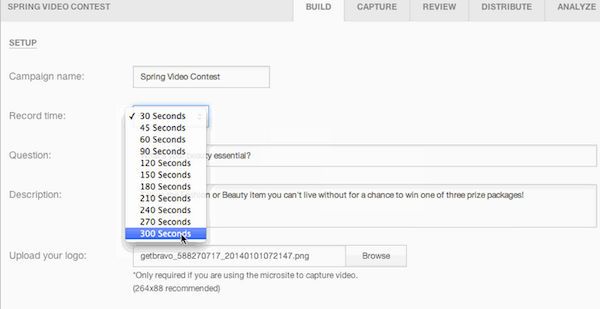 Option to launch a video contest (with voting capabilities). Finalize – videos can be reviewed, embedded, tagged, and shared. The final product is scalable to mobile devices and tablets, so people can hear about how great you are regardless of the screen they are looking at. It really is simple, but the support center has a bunch of tutorials and forums if you get lost along the way. Bravo is available to the public, and offers a free 30-day trial to new users – no credit card info needed. Pricing starts at $49 per month for their Starter Plan which includes 1 campaign, 5 videos a month, and standard analytics. More robust plans are also available, as are custom enterprise solutions. Check out all available plans and sign up for your free 30-day trial now at GetBravo.com. Adam Corl is a New England native with a passion for sarcasm, wine that tastes expensive, and keeping his parents questioning his life choices. This combined with a keen interest in organizational behavior and social science research has lead him to fund his nomadic lifestyle through freelance writing and research endeavors. When he is not writing about bootstrapping magic and project management tools you can find his stuff at The Bubble, where he is a staff writer.